• Contraceptive services and maternal and newborn health care enable women and couples to have the number of children they want, to time births as they desire, to deliver their babies safely and to have healthy newborns. Long-term benefits range from increases in women’s and children’s education to stronger national economies. • Though progress has been made, Africa* lags far behind other world regions on measures of contraception and maternal and newborn health. It is home to only 19% of all women of reproductive age (15–49) in developing regions but accounts for 68% of maternal deaths and 42% of newborn deaths. • In Africa, more than four in every 10 women of reproductive age want to avoid pregnancy, a total of 125 million women. However, 47% of women who do not want to become pregnant—58 million in 2017—either use no contraceptive method or use traditional methods, which typically have low levels of effectiveness. These women, who are defined as having an unmet need for modern contraception, account for 90% of all unintended pregnancies in the region. • The number of women with an unmet need for modern contraception in Africa has decreased from 61 million since 2014. • The proportion of women wanting to avoid pregnancy who have an unmet need for modern contraception varies substantially, from 22% in Southern Africa to 72% in Middle Africa. • Of the 42 million women in the region who give birth each year, many do not receive the essential components of maternal and newborn care recommended by the World Health Organization (WHO). Only about half have four or more antenatal care visits (51%) or give birth in a health facility (56%). • The proportion of women giving birth who receive at least four antenatal care visits ranges from 44% in Eastern Africa to 86% in Southern Africa. • Only 26% of women and newborns in Africa who need care for medical complications of pregnancy and delivery receive it. • Each year in Africa, 211,000 women die from complications of birth, abortion or miscarriage, and 1.1 million babies die in the first month of life. Most of these deaths could be prevented with adequate medical care. • Providing all women and their newborns with the services they need at standards recommended by WHO would result in major health gains. • If all unmet need for modern contraception in Africa were satisfied, there would be a large decline of about 80% in the annual number of unintended pregnancies (from 23 million to five million per year), unplanned births (from 12 million to two million) and abortions (from nine million to two million). • If full provision of modern contraception were combined with adequate care for all pregnant women and newborns, maternal deaths would drop by 73% (from 211,000 to 56,000 per year), and newborn deaths would drop by 84% (from 1.1 million to 185,000 per year). • Levels of contraceptive and maternal and newborn health care are currently very low, particularly in Middle and Western Africa, and health systems are weak throughout much of Africa. Substantial investments in facilities, management, equipment and supplies, training and community outreach will be essential to providing all women with high-quality services. • Currently, services cost an estimated $6.5 billion annually in Africa—$942 million for contraceptive services and $5.6 billion for maternal and newborn health care. • Meeting all women’s needs for modern contraception in Africa would cost $4.2 billion annually, an increase of $3.2 billion from the current costs. This additional investment would provide improved quality of care for current contraceptive users, as well as coverage for new users. • In the absence of this additional investment in contraceptive services, fully meeting the current need for maternal and newborn care would cost $24.0 billion annually. • However, fully satisfying women’s need for modern contraception would lower these pregnancy-related costs by $5.8 billion, to $18.2 billion. This is because reducing unintended pregnancies means fewer women and newborns will require care, and this makes other health care investments more affordable. • More specifically, each additional dollar spent on contraception would reduce the cost of maternal and newborn health care in Africa by $1.79. • Fully meeting women’s needs for both contraceptive services and maternal and newborn health care in Africa would cost a total of $22.3 billion each year, more than three times current spending. • It would cost $18 per person per year to fully meet the need for both modern contraception and maternal and newborn care in Africa. • As governments and international agencies seek to fulfill their commitments to meeting Sustainable Development Goals by 2030, they should address the need for greater attention to and investment in contraception and maternal and newborn health services. • These investments save money; have enormous benefits for women, families and society; and are cornerstones of sustainable development. *As defined by the UN Population Division, this region comprises Eastern, Middle, Northern, Southern and Western Africa. 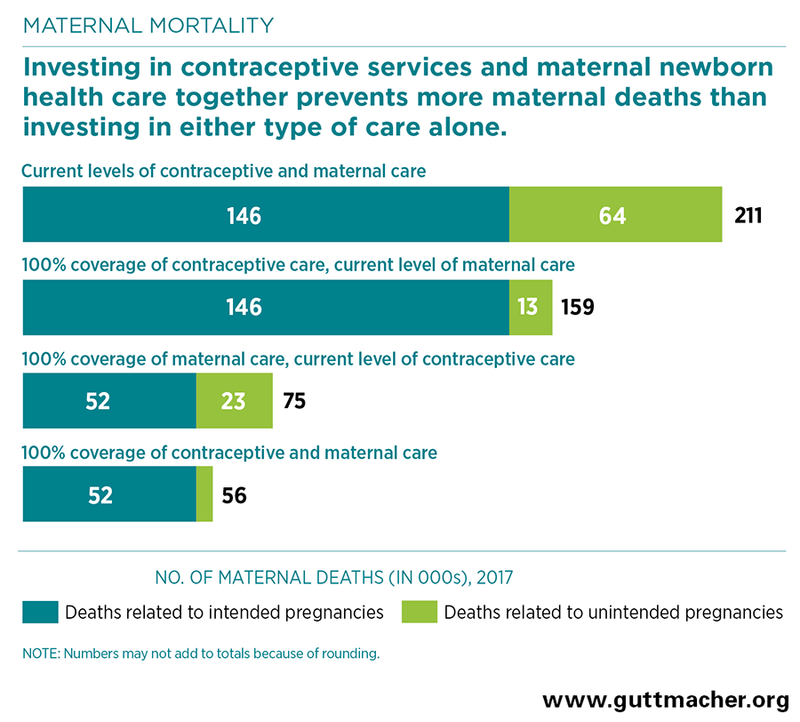 The information reported in this fact sheet is based on data produced for Darroch JE, Sully E and Biddlecom A, Adding It Up: Investing in Contraception and Maternal and Newborn Health, 2017, New York: Guttmacher Institute, 2017. Additional data and sources can be found at https://www.guttmacher.org/fact-sheet/adding-it-up-contraception-mnh-2017. The research team includes (in alphabetical order) Suzette Audam, Grant Kopplin, Taylor Riley and Susheela Singh. The study also benefited from input from Eva Weissman, independent consultant, and Karin Stenberg, World Health Organization. This fact sheet was made possible by UK aid from the UK Government, and grants from the Bill & Melinda Gates Foundation and the John D. and Catherine T. MacArthur Foundation. Its findings and conclusions are those of the authors and do not necessarily reflect the positions or policies of the donors.